It’s been really long, ever since I wrote any post. It’s been a really busy month otherwise, It’s really difficult to stay away from writing – consciously. 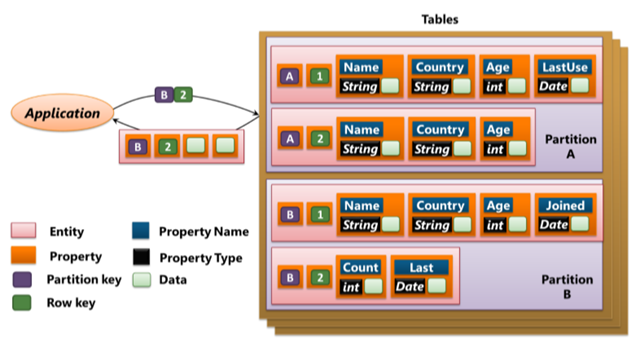 This is the final post from this series of posts about NoSQL technologies. My Intent for this series of post, is to cover breadth of technologies to help the readers understand the bigger picture. It feels like a revolution where the technology is growing at a massive scale. Everyone must have , at least a basic understanding about the technologies like Cloud Computing/NoSQL/Big Data/Machine Learning etc. Referring to above picture – If we need to select column data , in RDBMS systems the data is stored in the unit of a complete row on the page. Even if we select a single column from the table, entire row has to be brought in the memory. For business intelligence reports , we generally rely on aggregations like sum /avg /max /count etc. Imagine aggregation of a single column on a table with 1 billion rows will have to scan entire table to process the query. On the other hand, if the data is stored in the form of individual columns, then aggregations reduce huge number of I/Os. Moreover, Columnar databases offer huge compression ratio which can easily convert a 1 TB into few GBs. 1. The data will picked depending on the columns selected in the query instead if the entire row. Mostly, these aggregations go for scans and scanning TBs of data is going to take very long. By leveraging Columnar databases, the I/O will drastically reduce. 2. Using Columnar databases e.g. HBase, we can leverage distributed processing to fetch the result faster. As we know, with these NoSQL technologies , we can scale out really well and can leverage power of distributed queries across multiple machines.The data which takes days to process can be processed within minutes or seconds. Major Known players for Columnar databases are: HBase, Cassandra, Amazon’s DynamoDB and Google’s Bigtable. It’s a fact that NoSQL technologies are growing at a rapid pace. I even heard someone saying NoSQL is old now , NewSQL is the new trend. NewSQL gives performance of NoSQL and follows ACID principals of RDBMS system. Anyways, lets focus on Graph DB for now. 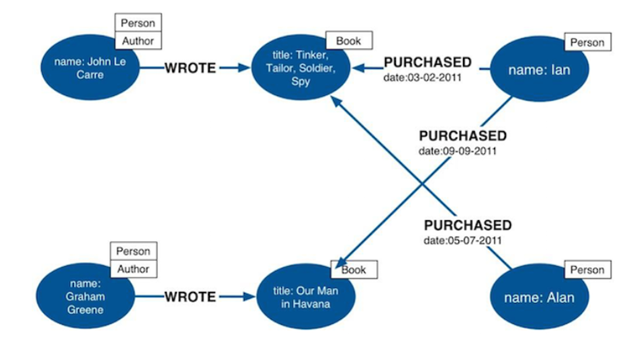 Graph databases are specialized in dealing with relationship data. They specialize in finding the patters and relationships between the certain events or employees of organization or certain operations. It can help to make the application more interactive by suggesting more options based on the previous patterns of browsing or shopping. 2. LinkedIn offering suggested connections or connections from the same organization-that’s the use of Graph Databases. 3. Flipkart/Amazon offering “people also viewed” (Real time recommendations) options help you purchase more products. 4. Master data management where based on the support case, knowledge base article could be suggested for the faster resolution. 5. Dependency analysis of shutting down an IT operation i.e. users which may be impacted if this router is shut down for maintenance. It can help to send the advanced notification to those employees. Neo4J is one of the best Graph DB companies today. The language used for Neo4J is Cypher. It’s being used largely by the major Tech./healthcare/manufacturing companies. Please check this video for more details about relationship and properties. It’s series of videos which you could look for to understand more about this subject. This is the one of the most famous NoSQL technologies today. In Document Store we don’t store word/PowerPoint/Excel Spreadsheets but majorly JSON documents. The reason why JSON has become so popular , with websites like Flipkart,Amazon or even gaming companies or cross device communication, is the ease to use and high performance while working with application of large scale. Let’s take an example of an application which stores data from a sensing device. It hits thousands of time within seconds and moreover, the data transmission is in the form of JSON. If the data is stored in the RDBMS system,with every hit the JSON will have to converted to a plain data and inserted into the table. If it’s to be done thousands of time per second , there will definitely be an overhead. There will be an issue with the scalability of this system. 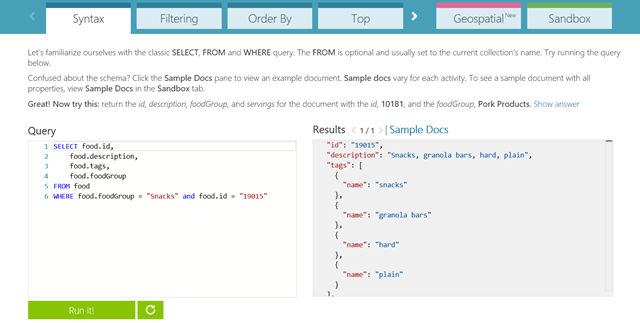 How about saving the data in Document Store in the form of JSON itself and then if required just query to fetch the results. Another example is, the shopping websites or blogging websites or even online book library where we don’t want to be schema bound and there is no need to maintain relationships between data, Document Store DBs play a vital role. The release cycle of the application becomes shorter due to schema free architecture and lesser need to perform database impact analysis. Just for information, If you have heard about Polyglot persistence based applications e.g. shopping websites / Online Libraries or event video libraries , these kinds of services use multiple database systems e.g. for product displays they use JSON (Document store) , for transactions they may use RDBMS , for relationship data they may use graph DB etc. . We have lots of flexibility these days to leverage various DB systems to cater to different needs. DocumentDB, MongoDB , CouchDB , RavenDB are key players in the market for Document Store. 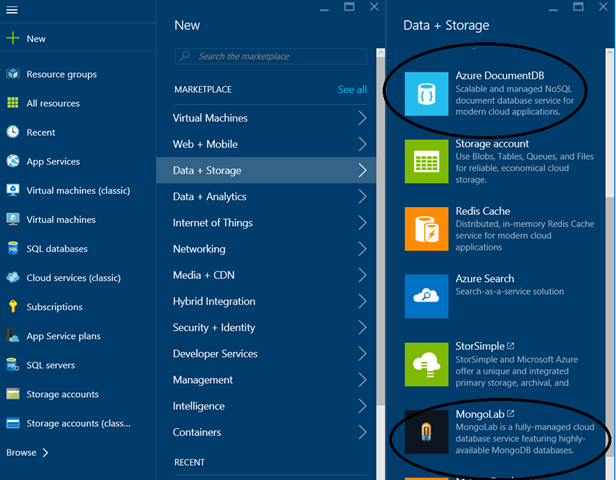 DocumentDB and Mongolabs (MongoDB on Azure) are two managed services that can be hosted in Azure PaaS platform. However, MongoDB , CouchDB and RavenDB can be installed on bare metal machines. We will discuss about DocumentDB in detail in the future posts. First, I will try to finish the introduction and use of all NoSQL databases types.